The man suspected of ramming a car into a crowd of counter demonstrators at a white-nationalist rally, killing one and injuring more than a dozen others, was facing multiple charges on Sunday morning, including second-degree murder. 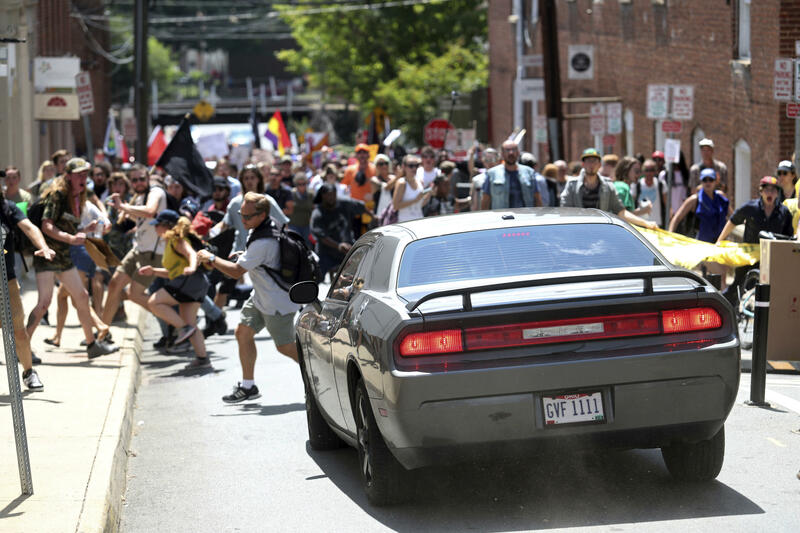 Video of the incident in Charlottesville, Virginia, shows the car appearing to plow deliberately at a high rate of speed over multiple counter-protesters at the rally. Charlottesville mayor says President Trump "should look in the mirror"
Heather D. Heyer, 32, a Charlottesville resident who police say was crossing the road at the time, died of her injuries after being rushed to the hospital. A spokesperson for University of Virginia Medical Center said early Sunday morning that the hospital was still treating five victims of the incident in critical condition, four in serious and another ten in fair or good condition. On Saturday night, the FBI and federal prosecutors announced that a civil rights investigation had been opened into the vehicular death allegedly caused by James Alex Fields Jr., 20, of Maumee, Ohio. Fields is being held without bail on second-degree murder, malicious wounding and failure to stop at the scene of an accident that resulted in a death, officials said. The civil rights investigation raises the prospect of other charges being filed in the coming days as the investigation continues. Video of the incident showed a grey Dodge Charger plowing into counter-protesters who were marching through the city's shopping district. The force of the collision hurled several people into the air. Bystanders could be seen running in every direction while others stood by screaming for help. Neighbors of Fields have said he lives at an apartment with a woman in a wheelchair and that he drives a silver Dodge like the one used in the incident. "I thought it had something to do with Trump. Trump's not a white supremacist," said Bloom, who became visibly upset as she learned of the injuries and deaths at the rally. His arrest capped hours of unrest on Sunday as hundreds of white nationalists, neo-Nazis and Ku Klux Klan members clashed with counter-protesters in the historic southern college town. Tensions first began to rise on Friday night, when hundreds of torch-carrying white nationalists marched through the campus of the University of Virginia, which was founded by Thomas Jefferson. They were protesting the decision to remove a statue of Confederate General Robert E. Lee from a Charlottesville park. The University of Virginia (UVA) office of the president Teresa A. Sullivan released a statement on Sunday calling out the violence and offered condolences to the lives lost over the weekend. "The University supports the First Amendment rights to free speech and peaceable assembly. Acts of violence, however, are not protected by the First Amendment," the statement read. "Violence and bigotry are not political positions. We strongly condemn intimidating and abhorrent behavior intended to strike fear and sow division in our community." The statement added, "As a public institution, we value diversity, inclusion and mutual respect. We value an environment in which learning happens. The views of many of the groups who converged on Charlottesville are in direct contradiction with this. There were racist, anti-immigrant, homophobic and misogynistic chants. Such rhetoric is not intended to bring us together; it is intended to drive us apart." Thousands of students and hundreds of faculty and staff will convene on UVA next weekend for a new academic term, the statement said, and the campus will provide safety and health resources. Hundreds of people threw punches, hurled water bottles and unleashed chemical sprays. Some came prepared for a fight, with body armor and helmets. Videos that ricocheted around the world on social media showed people beating each other with sticks and shields. Virginia State Police said in a tweet Saturday night that three additional men had been arrested in connection with the violence in Charlottesville. Two of the suspects were from out of state, one of whom was charged with carrying a concealed handgun. President Trump urged restraint amid the violence, saying: "We condemn in the strongest possible terms this egregious display of hatred, bigotry and violence, on many sides." But Charlottesville Mayor Michael Signer appeared to suggest that Mr. Trump himself should shoulder some of the blame for the nation's tense racial climate. "The tide of hatred and intolerance and bigotry that has come to us and has marched down with torches the lawn of one of the founding fathers -- it is brought here by people who belong in the trash heap of history with these ideas," Signer said. "There is a very sad and regrettable coarseness in our politics." Virginia Gov. Terry McAuliffe, who declared a state of emergency this weekend, told the supremacists, many who came from out of town, to go home. On Saturday night, Senator's Sherrod Brown and Rob Portman from suspect Fields' home state of Ohio, both tweeted that the incident should be considered domestic terrorism. At least six Republican senators, including Portman, have referred to Fields' alleged attack as "domestic terrorism." Sen. Cory Gardner (R-Colorado), leader of the National Republican Senatorial Committee in 2018, called on Mr. Trump to do the same. With pressure mounting over Mr. Trump's response, a White House spokesman released a statement Sunday morning claiming the president had said, "very strongly in his statement yesterday that he condemns all forms of violence, bigotry and hatred, and of course that includes white supremacists, KKK, neo-Nazi, and all extremists groups." President Trump's daughter Ivanka, a senior aide to his administration, tweeted early on Sunday morning that "racism, white supremacy and neo-nazis" have "no place" in American society, and she urged the county to "come together as Americans -- and be one country UNITED."